Size suggested height 71", waist 38" - 41"
Why us?TOPTIE have been concerned with work apparel manufacturing for a long time. We make a great deal of prophase preparation before marketing. We test, tweak and massproducing. By continually expanding and updating its selection, now we offers garments ranging from reflective vest and work vest to items such as chef coat, lab coat and coveralls. Whatever you do, there is always one for you. This is the goal that we have been working on. You'll be ready for any kind of job with overalls from TOPTIE. Both these overalls are designedon the basis of such pragmatic considerations as the needs of most of job. Every single one of them has breast-pocket, narrow pen pockets, front trouser pocket, right-rear cargo pocket and side tool pockets. Whether you're stringing fence, digging in the crawl space or changing tires in your Sunday suit. These tough, all-purpose overalls go anywhere the job takes you, and are generously sized for maximum comfort. This bib overall is made of high quality fabric, 11.5 oz 100% cotton. 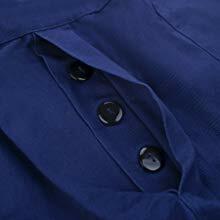 It is a durable and dependable overall made to survive the hard work that often destroys less worthy clothing. The button closures, adjustable bib straps and elastic waistband are designed to make it easy to wear. 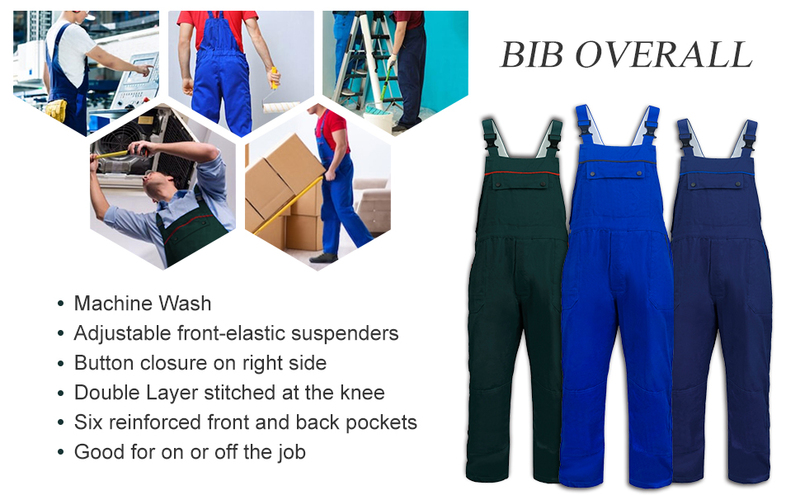 For generations of hard working men, bib overalls were the uniform of choice across America. Our bib overalls have one big breast pocket, one back cargo pocket, two large lower-front pockets and two knee pad pockets, making all that tools portable. 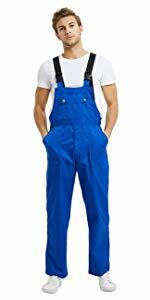 It will be a good uniform for painters, decorators, gardeners and more. 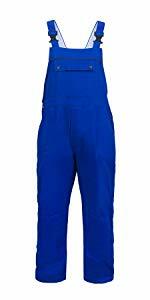 This big-tall work overall represents about the same leap forward in performance compared to the above overalls. 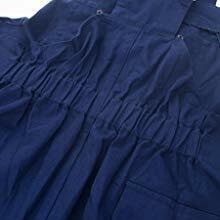 This bib overall is made of 8.5 oz 65% Polyester 35% Cotton. It holds just one color, bright-blue color. It's the same color as the royal blue above. The comfortable, adjustable elastic straps that flex with every move to relieve stress on your shoulders and have new spliced strap and unbreakable buckles. Elastic waistband and waist side button are designed for best fit over a tee or sweatshirt. Also the zipper closures make it easy to wear. Two Cargo pockets with hook and loop fastener, make all the tools portable. Don't worry about dropping repair tools, screws, etc.Security will be improved greatly. This size is bigger than the one above. Please order according their size chart.